Using decorative stones is one of the best ways to improve the aesthetic appeal of interior and exterior areas of a property. Veneer stonework, when performed by experienced and certified contractor can transform a dull space in your home into an interesting and stunning spot. Choosing the right veneer type, design, and color is also a critical factor in the successful completion of your veneer stonework project. You need to hire expert people who can guarantee the outstanding installation of your stone veneers. Just call us at Rainbow Acres Landscaping and we'll take care of the rest. 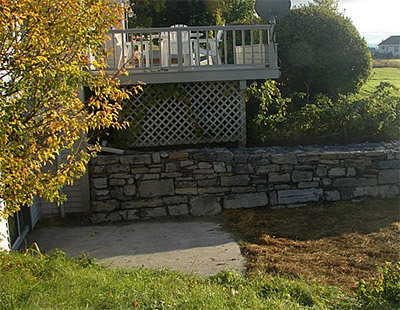 We have completed a lot of similar projects in Addison, Vergennes, Bristol, Middlebury, Burlington, Brandon, Essex Junction, South Burlington, Jericho, and Montpelier, VT.
Stone veneer can turn an ordinary wall or space into a distinctive and elegant home feature. And with the help of skilled installers, you can get a highly personalized design that reflects your lifestyle or unique design taste. Stone veneers are versatile materials since they can be used in interior and exterior applications such as walls, columns, sitting areas, and fireplace surrounds. Achieving Old World and contemporary look or any design theme that you may desire is easy. It is possible because of the wide variety of available colors, shapes, sizes, and finishes. You can also choose from the different types of stones available such as slate, limestone, and sandstone. Choosing the right materials for your property improvement project can be a daunting task, especially if the task is choosing between cultured and natural veneer. These veneers have their pros and cons, specific applications, and unique features, so it will be hard for an ordinary homeowner to make the best decision. But here at Rainbow Acres Landscaping, we make sure that our clients understand the advantages and disadvantages of each product or material. We recommend cultured veneers for those who want a cheaper option. This type is available in various designs but costs lower than natural veneer. However, durability and ease of maintenance are common issues for the manufactured type. Natural stones are still the best materials to use if you want to have beautiful and long-lasting features in your property. In fact, every veneer stonework project that we create can last for decades without needing frequent maintenance efforts. A lot of home improvement contractors are now recommending the use of veneer panels for interior and exterior walls. With the use of revolutionary technology and excellent features, these panels offer several advantages over traditional veneer installation. They are easy to install, lighter, stronger, and weatherproof. The project cost is dramatically reduced because it allows faster installation of the stone veneers. The panel system also uses thin veneer, which is cheaper than ordinary stone veneers. Our crews are knowledgeable of the traditional veneer installation methods. They are also creative and use proven techniques when working on veneer stonework. But with the introduction of modern systems, we also have to offer clients other options. At Rainbow Acres Landscaping, we can guarantee fast completion of your home improvement or remodeling project by using veneer panel systems. We can use stacked veneer panels on your walls and other vertical structures around your home. Some of the panels we use measure 24"x6", so the installation process is fast and easy. Since they are lightweight, you won't have to worry about the structural integrity of your existing structures. These modular veneer panels are also available in different design and color options.